Fewer risky corporate borrowers defaulted on their bonds and loans last year at the lowest rate since 2007. The speculative-grade default rate, which tracks so-called junk-rated issuers, fell to 2% last year, down from 3% a year earlier, according to Moody’s Investors Service. That’s the lowest since the 1% recorded in 2007, which was a more than quarter-century low. 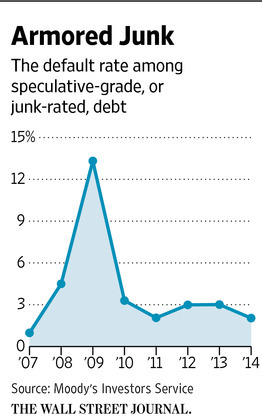 The historical average default rate among junk-rated companies is 4.5%. Moody’s predicts the default rate will rise to 2.7% this year, as expected increases in interest rates by the Federal Reserve, weak economic growth abroad and geopolitical concerns diminish investors’ appetite for risky debt. The recent low default rates reflect the economy’s strength in the U.S., home to the lion’s share of rated defaulters, as well as near-historic lows in interest rates and easy access to refinancing capital. “A series of shocks to interest rates” could push unemployment higher and curb the economy in a worst-case scenario, according to Albert Metz, managing director for credit policy research at Moody’s. Even in a darker-than-expected future, he said, the speculative-grade default rate “doesn’t get really near the recent peak,” of just over five years ago, when it topped 13%. Moody’s assumes in its best-case projections that U.S. unemployment ends the year at 5.2%. On Friday, the Labor Department said unemployment fell to a better-than-expected 5.5% in February. The number of junk defaults fell by a quarter last year to 51, but their total dollar value jumped to nearly $68 billion, thanks to the bankruptcy of Energy Future Holdings Corp. in the spring. Risky corporate borrowers defaulted on their bonds and loans last year at the lowest rate since 2007. An earlier version of this article incorrectly stated that fewer defaulted last year than in 2007. Posted on March 11, 2015, in Postings. Bookmark the permalink. Leave a comment.